All you need to know about how to buy an expired domain name. First do your background research about the domain name your desire and then use websites like GoDaddy, Tucows, SnapNames expireddomains.net etc. If you want to start a blog or a website, the very first thing you need is a domain name. For example, techwelkin.com is a domain name. Selecting a good domain name is crucial because it becomes the address of your blog or website. To acquire a domain name you would need to buy it and keep renewing its subscription periodically. While some people prefer to purchase a new domain name, others prefer to buy expired domain name. 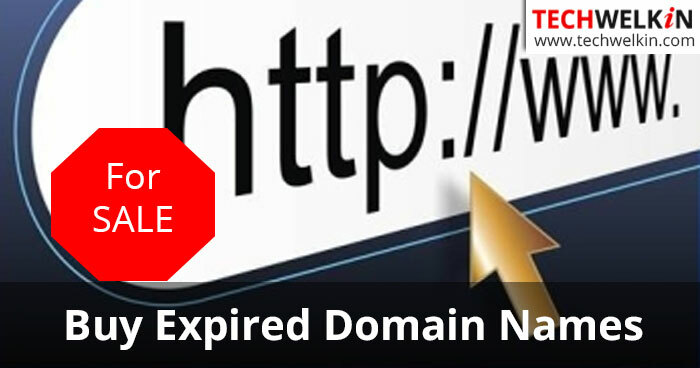 In today’s article we will discuss why and how to buy expired domain names. We will also talk about pros and cons of this approach. Why to Buy Expired Domain Names? The very first question you would ask is why we should even think about buying an expired domain name? Why not to go for a new one? Well, every expired domain name has a history associated with it. Some have a bad history (for example, the domain hosted bad content and was penalized by search engines). And others may have a glittering past (for example, the domain hosted a high traffic website with good quality content — but the website owner forgot to renew domain name subscription). If you do a thorough background check on an expired domain name and realize that the name was associated with a good quality website — you can very well consider it to be like winning a lottery! You should immediately buy the such an expired domain name. If you find that the domain name has previously been registered, you should do research to find out what kind of content was ever hosted on that domain. Some people buy domain names just to take ownership with the intention of selling the domain name later at a higher price. People generally do not host any content on such domains as they only want to sell them off at a premium price. NOTE: If you think that somebody is holding a domain name that should be rightfully yours — you can appeal in the WIPO against it. Trademarks and celebrity names are examples of names that WIPO has ordered to be transferred to the rightful owner. In short, if you buy donaldtrump.com — you will not be considered rightful owner of this domain unless you can prove that your name, your business’ name or something like that is Donald Trump. Older names tend to be better if good search ranking is one of your major objectives. Google is slow in giving new domains higher rankings. A completely new domain name is the one that has never been registered before. You can use our domain age checking tool to find out how long back a domain was registered. This tool will tell you if the domain name is a new one. Expired domain name you are considering may have changed hands more than once. You would need to find out all the history of what content was there on that domain. It may sound a daunting task, but thanks to Internet Archives, you can easily check how a domain name looked ever since it was first registered. Pretty easy! Domain Authority (DA) from MOZ is now considered pretty reliable measure for the quality of a domain. You must check DA of the domain you are considering to buy. You can check Domain Authority at the Open Site Explorer. If you want to host a website and make money through AdSense, you must be sure that the domain name has not been banned by Google AdSense. If someone violates AdSense policies, Google may ban that particular account — but sometimes, Google bans the domain name that was using the ad code from that AdSense account. In such a case, the domain will not be able to display AdSense ad units. To check whether a domain name has been banned by AdSense, you can use Sandbox tool developed by Amit Agarwal of Labnol. How Much Should You Pay for an Expired Domain? If you want to register a domain name, the current annual fee is roughly about $10-15. You will have get your domain name renewed whenever it is due for renewal. If you do not pay the fee and renew your domain name in time, most of the registrars allow a grace period of 30 days and if you fail to renew even during the grace period, your domain name will be considered as expired. Some registrars hold such expired domain names for few more months and may give it back to you if you pay a penalty. A friend of mine whose domain name expired was asked by the registrar to pay $100 to get his domain back. But if the expired domain name is put up for sale and it is bought by someone else, then you will almost certainly have to pay a much higher price. The new owner may ask for any price depending on the importance and business potential of the domain name in question. The price of expired domain names could range from a few thousands of dollars to a few hundred thousands of dollars. How an Expired Domain Name is Auctioned? Every domain name is registered with a particular registrar. And most of the registrars have partnered with a domain name auction service. In most cases this partnership is exclusive in nature. Therefore, all the names registered with a registrar will go to a particular auction service and not anywhere else. So, when a domain name expires, the registrar sends it to the partner auction service where it is listed for bidding. Registrars usually do not immediately send a domain name for auction. They wait for a few days for the original owner to renew the subscription. If you do your homework, buying an expired domain name may be a very good idea. Now let us take a look at some of the websites where you can buy expired domain names. Do you research and head for any of the following websites. 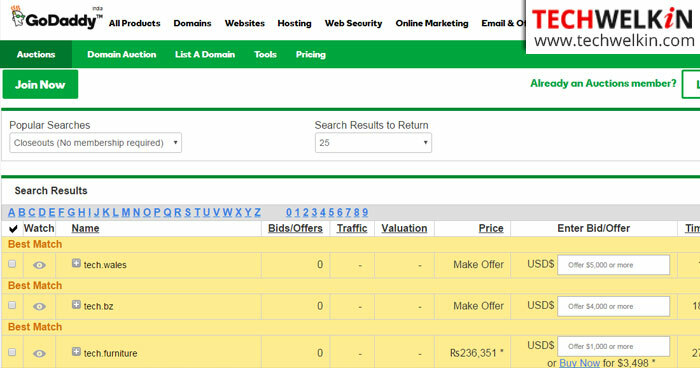 Here you will see the list of all the expired domain names and the bid information. In most cases, you can either bid for a name or you directly buy it at the minimum price set by the auctioneer. ExpiredDomains.Net lists millions of expired domain names. It also makes it convenient to see some important information about domain names — which include registration year, number of archive.org crawls, SimilarWeb top country, number of external backlinks measured by Majestic and other useful metrics. You can also place backorders for the domain names that are about to expires. This way you will be notified when (and if) the domain expires. Backorders are very useful as you will immediately get the domain name as soon as it expires. ExpiredDomains.Net gives you options to use any of the several backorder services. You can use any of these services to place your backorder. As soon as a domain expires and becomes available for purchase, these services attempt to register it for you. And the fastest finger wins! Whichever service will approach the registrar first, will get the domain. That is why these backorder services are also called drop catch services. If you follow these steps to buy an expired domain name, you will certainly grab a gem. Do not forget to thoroughly research the expired domain name that you want to buy. You will only waste your money (and may be something more than money) if you buy a bad domain name. Should you have any question on this topic, please feel free to ask in the comments section. We at TechWelkin and our reader community will try to assist you. Thank you for using TechWelkin! Really a nice guide to grab expired domains. I am using DomCop so far to grab and research expired domains.